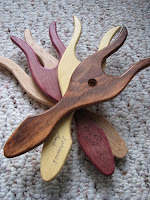 In the Woodshop - Part II - Spinner's Delight! As a continuation of last weeks Finds, more fun and useful items for fiber artist from the workshops of these wonderful wood-makers. 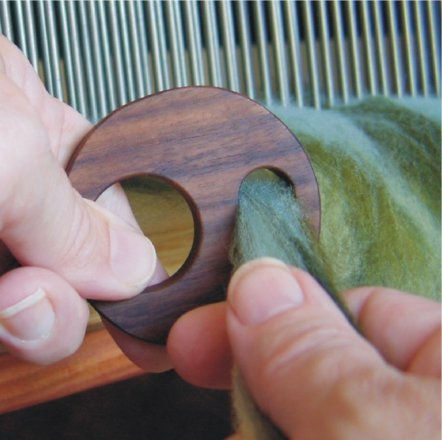 Spinners and dyers will find these are convenient tools to make our work simpler and more pleasurable. And you thought spinning couldn't get any better! It diz what it diz... which is what? 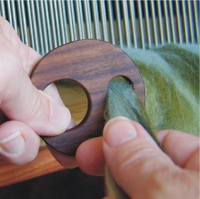 A diz is a tool for drawing fibers through before spinning to get a desired thickness. The picture shows it in use with a comb, but it's just as useful with prepared rovings or carded batts. TheSpinnersEmporium has pieces made from fine woods with great grain and color, if something is useful it might as well be lovely too! For learning to spin, or portability, or spinning funky yarns, or plying... or looking cool! 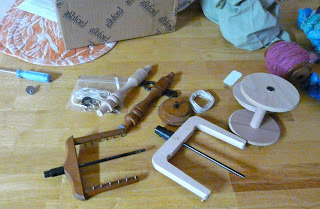 Nothing beats a drop spindle. 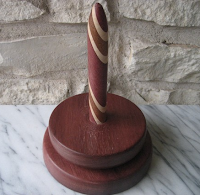 SpindlesandFiber has this neat looking piece, the segments of wood remind me of a spider web, and the striping of the wood grain completes the effect. 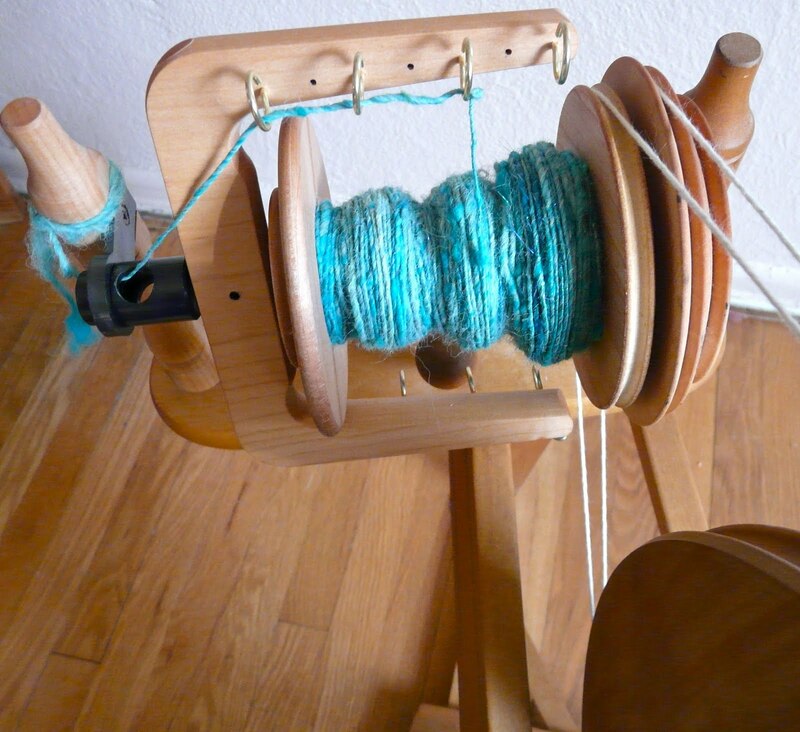 The weight of this spindle makes it suitable for spinning chunkier yarns as well. 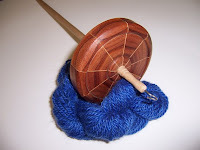 For spinning from a cake of roving without needing to constantly join, a spinner is super helpful! (That's right, spinners for spinners, are we clear?) 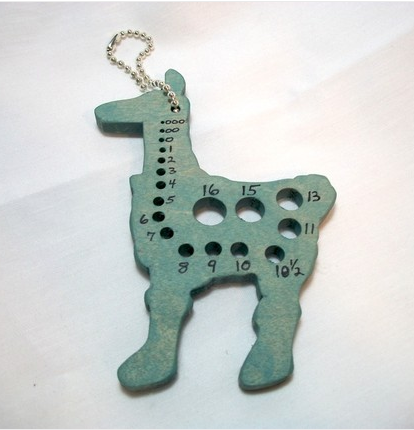 Craftiness has some really beautiful pieces, and this one is made from my favorite wood! 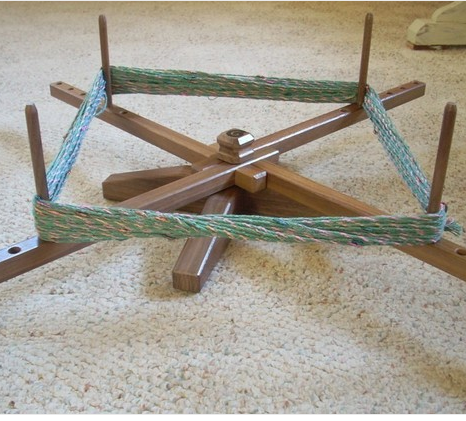 Knitters and Crocheters of course can also use this to feed yarn off a cake without tugging at a center-pull or letting the ball roll around on the floor. ... this lovely hand-turning piece in a light green. (what is it?) This nostepinne (don't use that kind of language with me!) from SunsetTurnings is useful for any crafter who works with yarn! Ok, I'll tell you what it is... a nostepinne is used for winding a center-pull ball of yarn. (ahh... I still don't get it?) 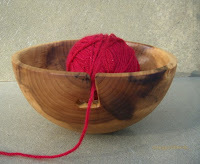 The yarn is wound around the wood and then pulled off leaving a gap in the center of the ball. 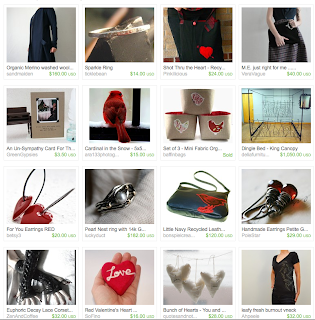 I just made an listed a new bag and already a treasury feature! 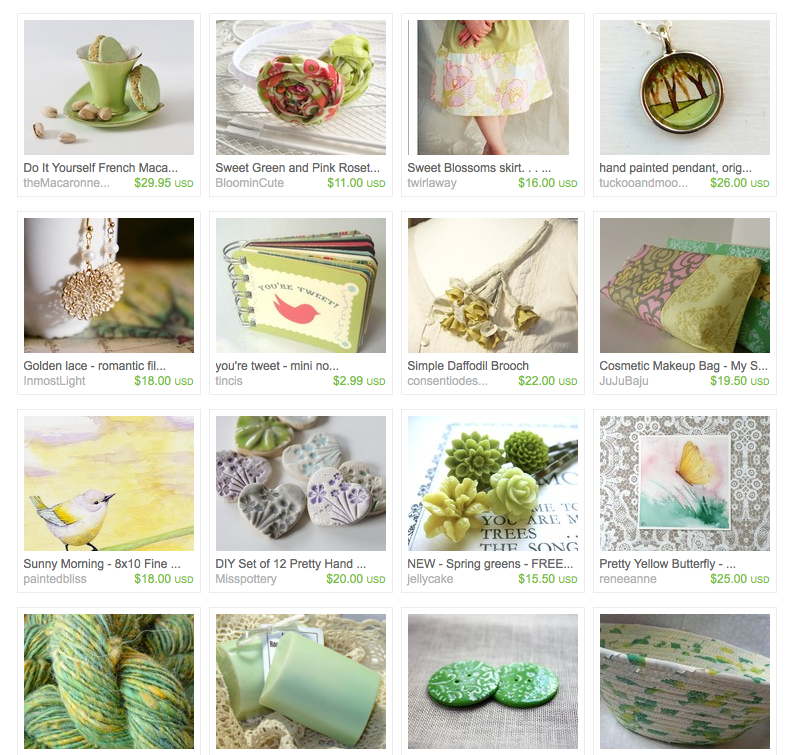 My Favorite Things by Sophiecls. 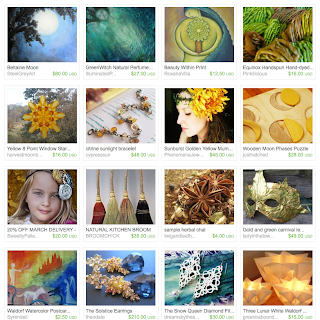 Another wonderful treasury, this time by VioletSparrow featuring lots of seasonal items, from all the seasons! The Wheel of the Year go check out the neat stuff! 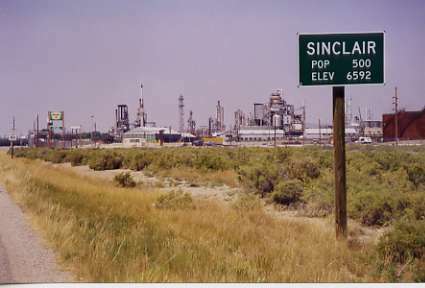 Sinclair is a small town on I-80, home and origin of the Sinclair oil company (yaknow, the green dinosaurs?) It has a large oil refinery, "company" housing for the workers there, and a gas station. There you can buy unleaded fresh from the pipes and without added ethanol (with no large urban centers in the state there are no rules about ethanol to reduce smog) which gets 3-5% higher MPG. This refinery is fueling most of the cars which drive by as the gas is trucked and piped all over the state and the west. Then there is coal, along I-80 there is a stretch of open coal mining, where thick seams sit right below the surface. A huge dredge crane scrapes up piles of the stuff. With it's remote location, and the less than stellar quality of the coal it is not trucked nor trained off to big city plants. A plant near Rock Springs burns it and high tension lines transport it to the grids of Utah and Idaho. Electricity is much lighter to move than coal after all. Wyoming accounts for almost %40 of the nations coal production, and coal is still the major source of electricity for Americans. 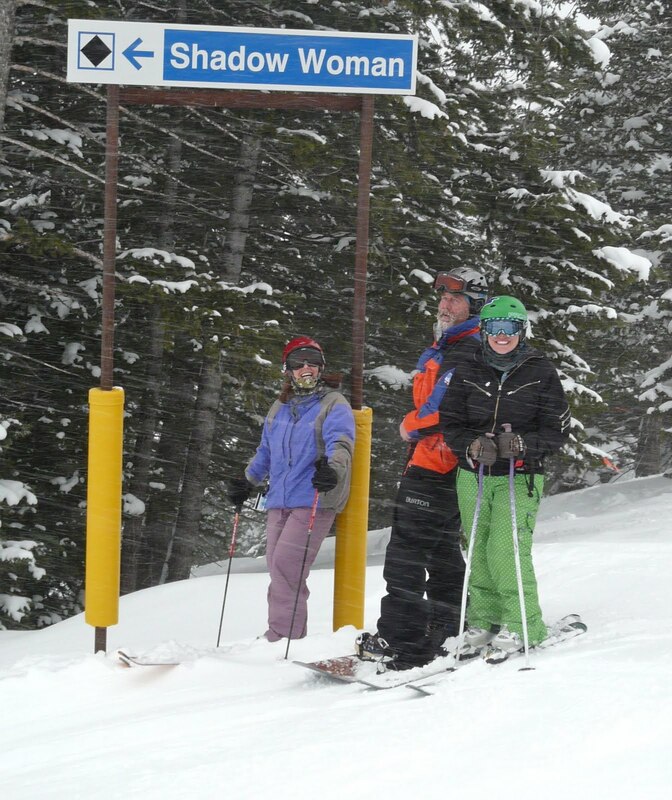 The other big source is Natural gas. 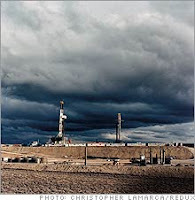 Now in many places natural gas production is simply part of oil drilling, but our demand has exceeded those easy supplies and so we have turned to coal seams and fractured underground rock layers. The geology of the state is actually fascinating, and makes for the importance of fossil fuels here. Sadly however, as the BLM has been offering up leases in areas that were formerly wild, they have relaxed rules on environmental impacts and the clean up of sites. Many areas that are important game and stock range and being crisscrossed with dirt roads large enough for heavy equipment and ponds of contaminated liquids related to drilling and pumping. The burning of natural gas is relatively quite clean, but with lax regulation the drilling has not been. And a sight that brings me great joy! Ridges dotted with lines of wind generators spinning wildly in the almost constant wind. 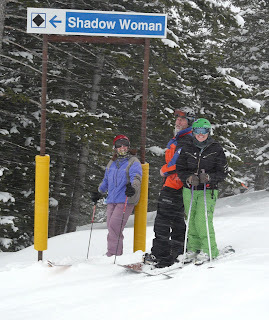 The power from these joins the I-25 corridor grid, and when you buy "renewable credits" you are funding the utilities investments in wind and solar farms. These are not without any impact on the area, a road must be built to construct the pylons, but after they're running they need only occasional maintenance. There has been concerns about birds, but the small number who are broadsided by a spinning blade is comparable to number who drown in contaminated ponds related to oil and gas drilling, or suffer the effects of pollution. Around the base of these wild animals and stock graze unmolested, and many are built on private land offering an important source of income to farmers and ranchers. 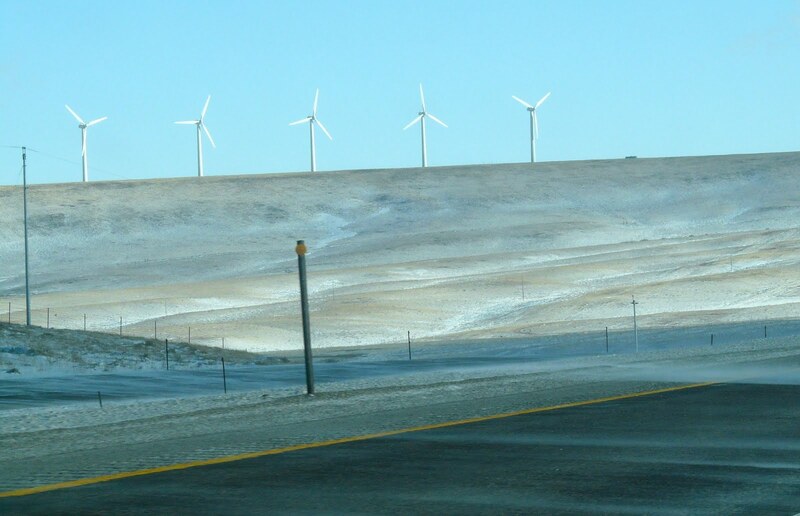 The future of energy in this country can be seen in a trip across the windy state of Wyoming, it will be a mix of sources, and work must be done to see that they get always cleaner and more responsible! 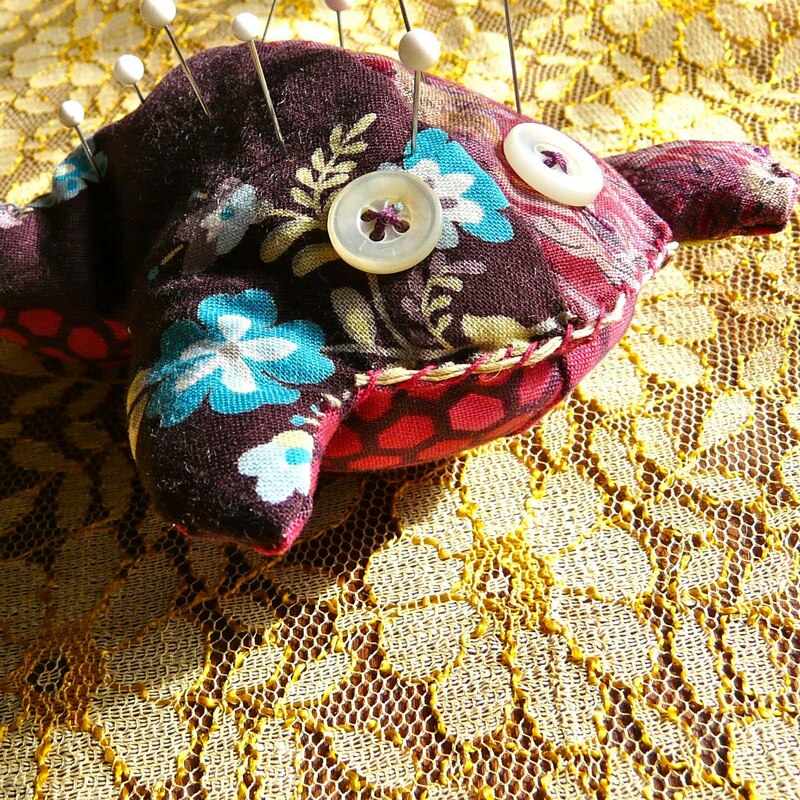 One customer even had strong recollections of their grandmother having a pincushion made in the same way, and requested a miniaturized version. 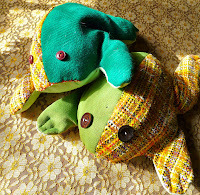 So I shrunk down the pattern and made some adjustments to create cute little froggy pincushions! I've been stuffing them with wool seconds from carding so they are very light and poofy. I may create a set of different sized frogs for my booth displays because they are soooo cute! 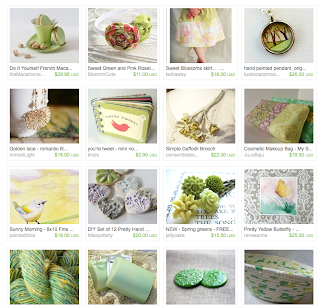 Another beautiful treasury feature - Patience is a Virtue - to remind us of what's coming next! 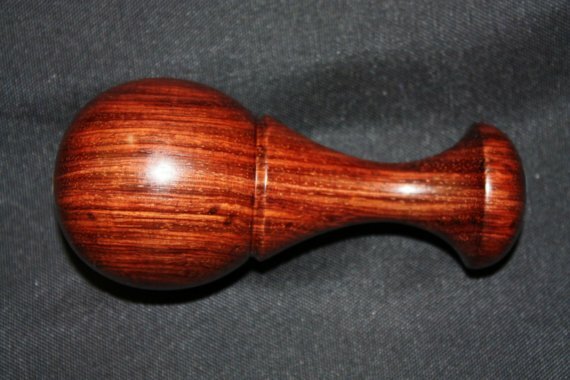 Are there many things more fun than a luscious lucet? These are ancient Scandinavian tools used to make long cords (similar to an i-cord). Syrendell has elegently shaped and beautifully colored lucets made from natural woods. They are easy to use, a quick youtube search brings up many videos to show the technique quickly and easily. You can use them with any size or type of yarn to make quick braided style cords and trim! The home knitter who likes to curl up on the couch with the cats and a good telenovela swears by the knitting bowl! It allows the yarn to spin and unwind freely without rolling all over the floor (cats everywhere are saddened by this) OneGoodTurn4U has lovely lathe made wood items with the gorgeous natural finish of fine woods. 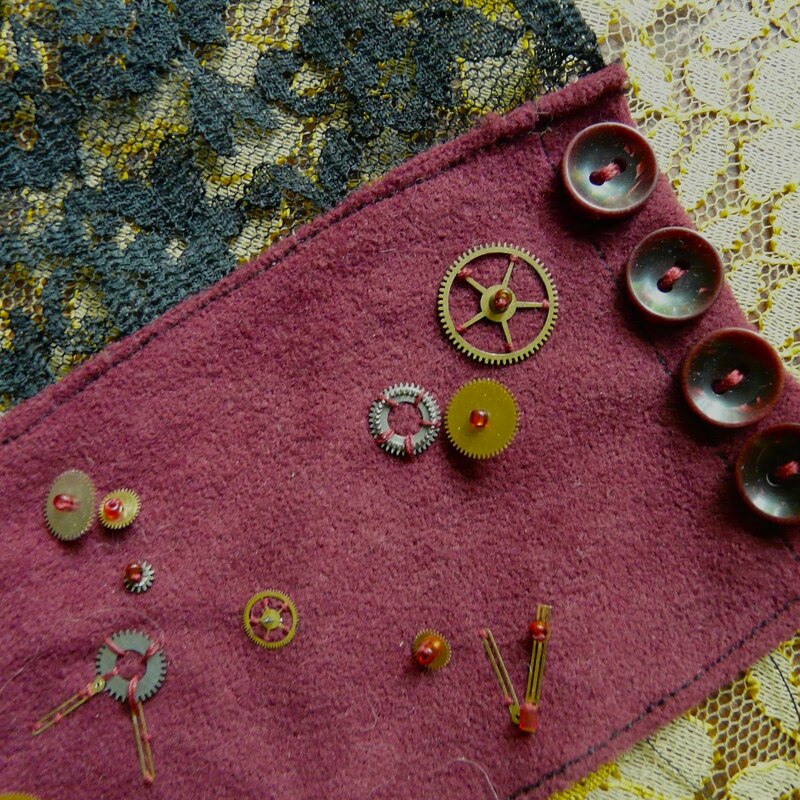 Here's an item from Granny's box of secrets - a darning egg! 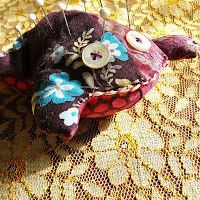 Placed inside a sock to fill out the shape when one is darning holes in the toes and heels. CustomWoodDesigns has this one in fabulous rosewood, and many others in different shapes and sizes (everyone has a preferred style). 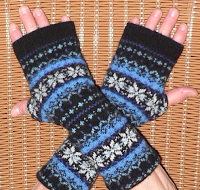 If you have ever spent hours on a pair of lovely hand-knit socks and then worn through the bottom... learn to darn! 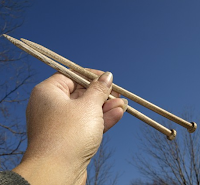 And naturally a very important part of the knitting process... the needles! 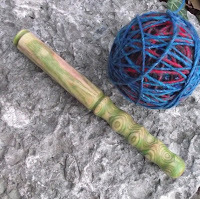 Sistermaide's lathe turned wood needles have lovely grain and finish. Wood needles are light, warm and easy on the hands, and environmentally friendly! Your handmaking enterprises deserve handmade tools. I had so many sweet finds that I couldn't fit them all in one post... so next weeks finds will be a continuation focusing on the spinners arts! The word Steampunk can mean many things, and interpretations are endless, but a sure symbol of steampunk intentions is the cog and gear. 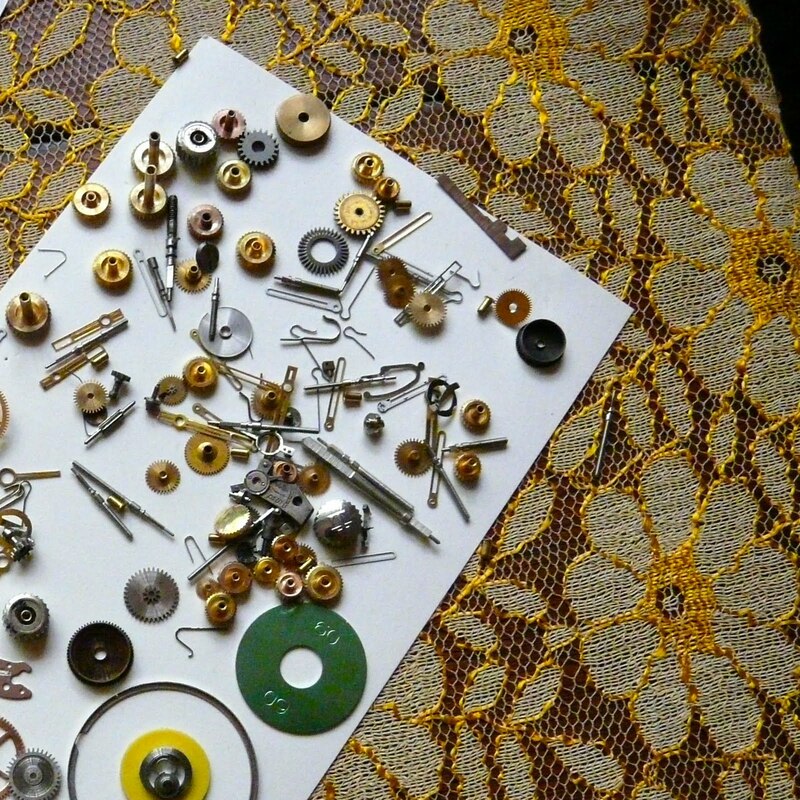 If you aren't a metalsmith, inclined to create your own parts I suggest pilfering old watch parts. I spent a dollar or two on etsy to get mine already separated and picked. 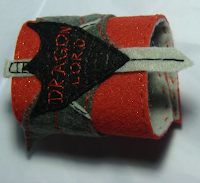 The cuffs them selves are a simple operation, a rectangle of fabric sized to my wrist, with lace trim on the lower edge. vintage buttons and a row of neat button holes complete the closure and the look. I also dug through the box of shinies and discovered a small vial of red seed beads perfect for adding glitter. 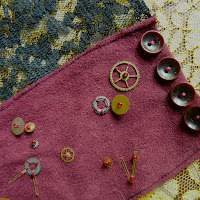 The gears hands and bars were tacked in place with thread, and beads occasionally helping secure a large hole. The greatest challenge for me was to give them the look of random scatter instead of evenly spacing each item across the cuff. Now just pair them with Gothic Victorian garb and you have a little touch of Steampunk for the day! 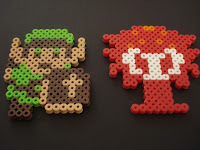 First off, pearler beads blast from the past! 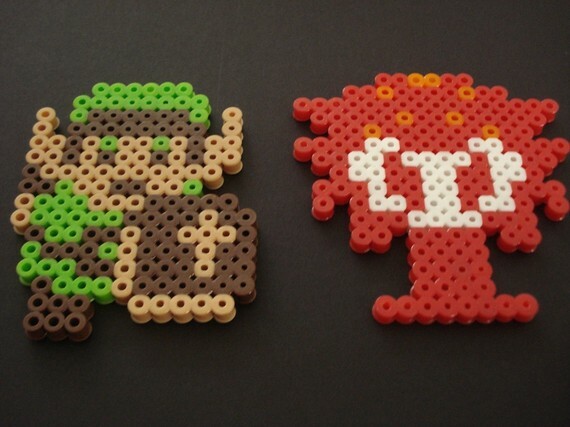 I remember making stuff with these in kindergarden and watching as an iron made magic things happen (to this day my irons are used on non-fabric projects far more then on clothes) And the original Zelda! Running around and doing a little stabby motion to kill oktoroks so simple and yet so much fun!PixelPlus had dozens of retro video game fun that is sure to bring a nostalgic smile to all children of the 70s and 80s. Anyone else wondering where their robot servant is? 2011 and no flying cars either... 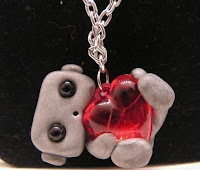 But there are heart stealing robots it seems, like this little guy made by SleepyRobot13. His shiny silver little hands clinging desperately to a huge heart - what a cutie! 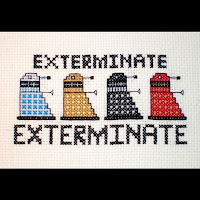 If you want to join in the crafting of nerdiness then check out this pattern from ElfStitch for Dr. Who Daleks. 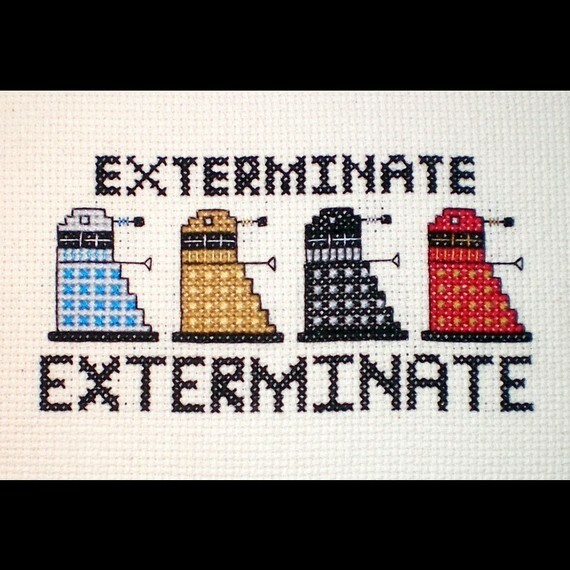 Classic sampler style with wicked destructive things = my favorite type of mash-up! 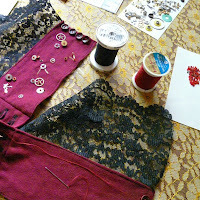 Looks quick and easy enough for the novice stitcher to complete. Sometimes it isn't enough to simply be the greatest, you need some wicked wrist armor to let everyone know that you pwn noobs. FeltQuirk hand-stitched this wonderful cuff of +5 awesomeness to that you could proclaim your oddness to the world, don't leave them guessing! Squeeee! Behold the cuteness of ButterflyLove1's baby black hole! 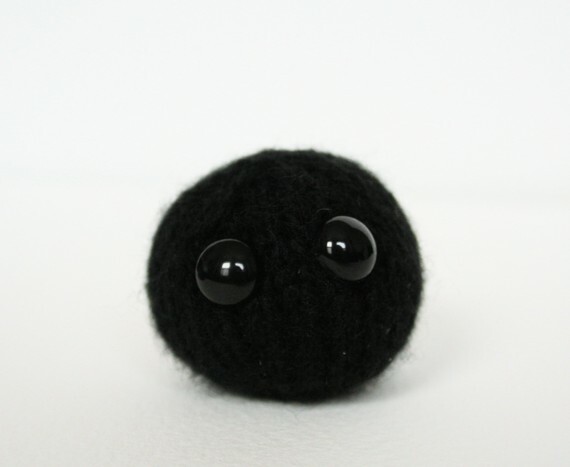 Those big inky eyes are just staring at you begging "don't get too close I'll swallow you" which also means "cuddle me please. Men - get this so you can use the pick-up line "Hey baby, wanna come over and check out my event horizon?" or you can just give it to the nerdy girl in your life. And finally, sparkles and geekery - two great taste that go great together! 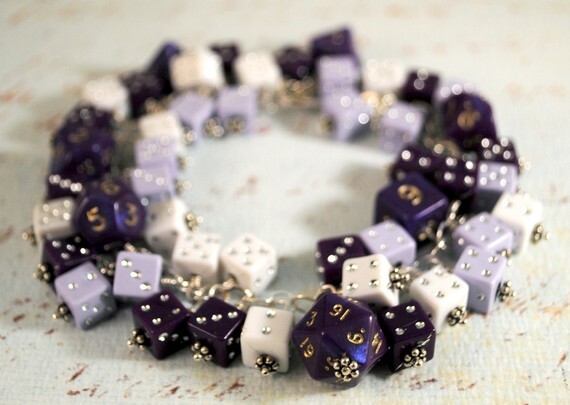 A few dozen dice of varying sizes and shades of purple that will weed people into three groups - a.) those who have no idea what a 20 sided die could be for b.) those who know and think you're a wierdo c.) those who want to invite you to game night! WyrdandWired brings together all these dice so nerds can fulfill their compulsion for shiny stuff! 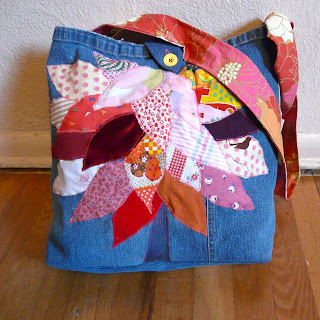 Whenever I go a while without making another tree bag I forget just how much fun they are! This one was a breeze. All the different fabrics and textures and colors just make every stitch surprise! I'll be restocking that section of my shop in the next few weeks until I get sick of them and have to stop treeing, so that a few weeks later I can rediscover it again! Yesterday I jumped right back into crafting by pulling out and setting up the drum carder to begin attacking some of the piles of fluff sitting around the craft room. 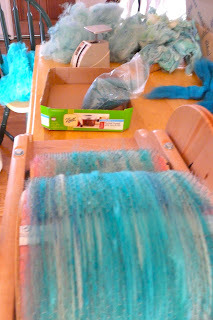 The alpaca fleece defies efforts to compact it and tends to burst out of bags and boxes... and this is before carding! 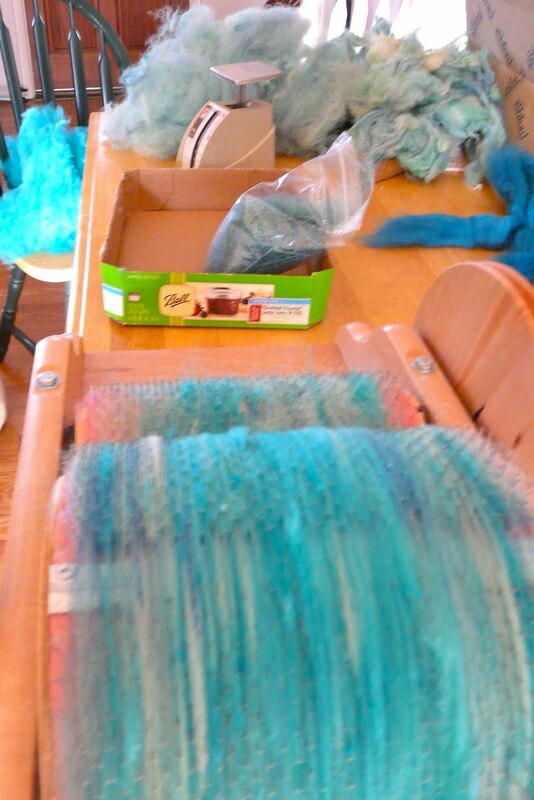 Once I place a lock in the carder is explodes into a cloud of fluff. So I blend the alpaca with heavier and greasier fibers to calm it down and give it strength. Then of course we add a little magic (AKA Mylar shreds) because sparkly yarn is happy yarn. I enjoyed my new bobbin and flyer sooo much as I was able to spin for several hours at craft night and never filled it up! 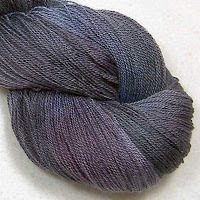 I think I will be able to fit all 6 ounces of this colorway on a single bobbin, which gives me lots of options on how to split the skein. Hooray yarn! More fun things for us makers! 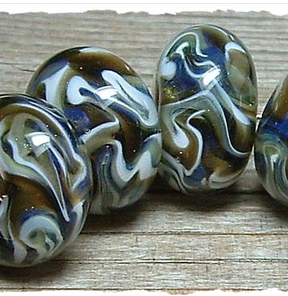 These glass beads in swirls of blue white and soft gold match the days outside. JavaBead has this set of jewelry maker's wonders in a solstice colorway ready to be made into winter adornments. A little frost sprite to bring the icyness inside? 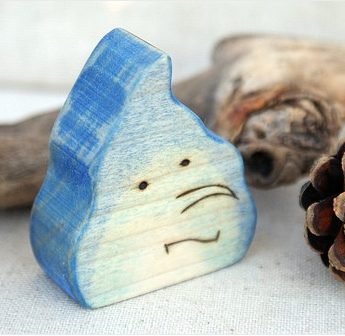 Mamaroots has lots of cute wooden friends, and this winter spirit is every bit as cute as the rest of them. 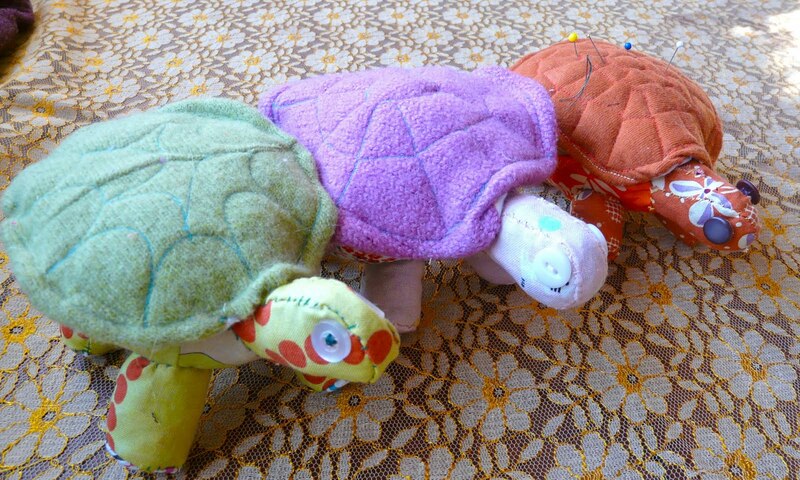 The natural wood and light color mean they are good playthings, but also cute as playthings for adults! And this satiny yarn in muted tones, so lovely and so delicate... FiberOptica offers this lace weight yarn for your winter knitting pleasure, imagine a faboo scarf in these colors! 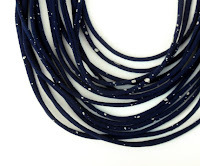 The subtle colors would go with a black and white outfit, or trail on top of bright wardrobe. 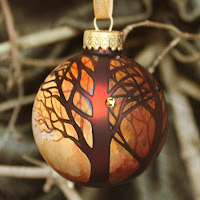 It's late for a solstice tree, but this lovely painted globe could be hung anytime. GwydionsGarden captures the soft light and hazy sun of a winter's day perfectly on this shimmery orb. I little gem makes for extra bling, and what girl can resist shinies? 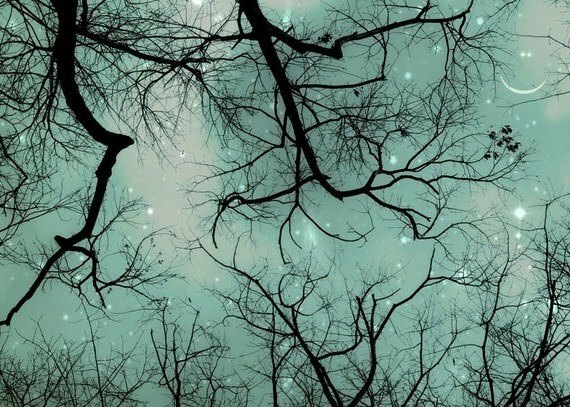 And in the dark of winter, a cold clear night with shining stars! This neck piece from Knobbly in lovely navy blue with sparkle truly is reminiscent of an astronomical scene. The long nights won't last forever, but this will always look good.